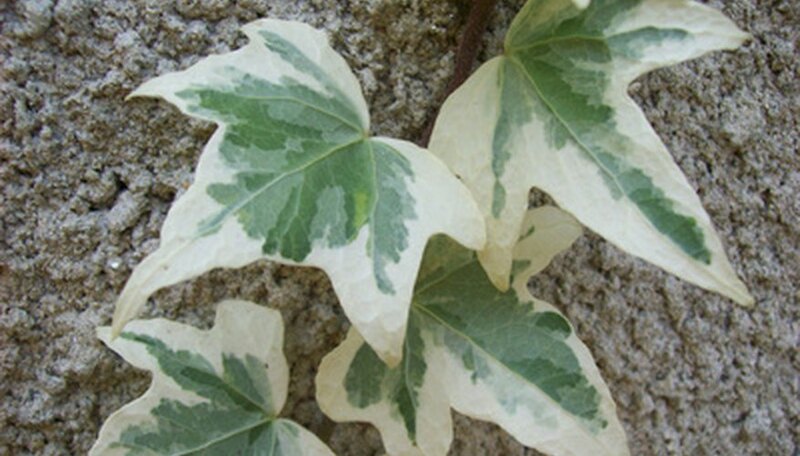 Use climbing ivy plants to cover walls, trellises or other structures made of metal, wood or stone. Examples of varieties of ivy include English ivy, climbing fig and Boston ivy. Ivy plants start out as ground covers but eventually find a tall structure that allows them to reach sunlight. Some ivy plants grow so thickly in trees they cause excessive shade and can eventually kill a tree. Other ivy plants have shallow roots that absorb nutrients from the soil, preventing other plants from growing. But ivy can add beauty to your landscape, if you plant it correctly. Find a place that is suitable for growing ivy. A place with a northern exposure is ideal because it does not receive direct summer sun in the afternoon. Ivy grows best in dappled shade. Ivy grows best in moist, well-drained soil. Because most ivies spread by stems that grow over the soil and produce roots along the stems, boggy or wet soil will cause the stems to rot. Clear the area of all weeds and any plants that will compete with the ivy. Remember that small plants will become overwhelmed by the ivy, and the ivy will climb on larger plants. Set up a trellis or other structure on which the ivy can grow. The structure may be wood, stone or metal, depending on the climbing ability of the ivy. Wood and stone are usually the best choices. Ivy will need assistance, such as tying with garden twine, if growing on a metal structure. Spread a 1-inch layer of compost over the planting area and use a hoe to gently work it into the top 2 inches of soil. Organic matter helps the soil hold moisture and provides nutrients to the ivy plants. Use a rake to smooth out the planting area. Plant the ivy plants as close as 6 inches apart, for quick cover, and within 6 inches of the trellis. Plant the ivy plants 1 inch deeper than planted in the previous location because they have shallow roots. Add water to the planting mix as you replace it around the roots of the plants. This prevents the formation of any air pockets around the roots. What Is the Name of the Indoor House Plant That Has Green Leaves and Long Vines?